Not everyone is the same size, and we appreciate that. At Promotion Pros, we offer custom logo shirts, hoodies, vests, jackets, and polos in big and tall sizes to suit everyone in your company. No matter how big and tall you are, we've got you covered. Our company logo big and tall apparel comes in a range of options, including fleeces, softshells and vests. Our promotional jackets with logos can be lightweight or insulated, so no matter the temperature, we've got something that will work for you. Plus, we offer a wide range of logo options so you can customize as you see fit. 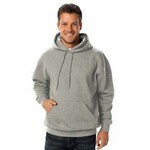 This custom logo men's tall pullover hoody sweatshirt features a half moon label mount with sewn down label. Our customized men's tall zip front hoody sweatshirt features a half moon label mount with sewn down label. Our customizable Core 365 Men's Tall Long Sleeve Polo Shirt has moisture wicking property and protect against microbes and UV rays. 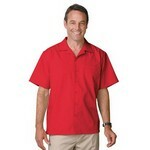 The Men's Tall Short Sleeve Polo Shirt is moisture wicking, antimicrobial and has UV protection. Our promotional men's 100% polyester pique polo shirt features BLU-X-DRI protection. 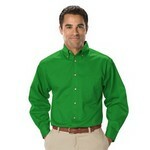 Made of 100% polyester, the fabric of this polo does not shrink and can withstand rigorous wear. Our Men's Big and Tall Bayview Half Zip features zippered pockets, attractive colors and allows adding a custom imprint to create impressive company products. This Men's Big and Tall CB WeatherTec Opening Day Softshell features bright colors, mock neck, soft fabric to create customized product for your events. This Men's Big and Tall Lakemont V-neck features long sleeves, jersey stitch, customizable with your company logo. 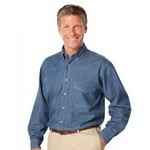 Our promotional men's long sleeve premium denim shirt is sandwashed for extra softness and shrinkage control. This custom logo men's long sleeve Teflon treated twill shirt features a wrinkle resistant soft touch finish.